Melissa @ Divani Chocolatier, Author at Go Foxburg! Now that we have explored one aspect of naming chocolates, wherein sounds form words, which become names leading to flavor fusions, resulting finally in a creative chocolate confection, let’s delve a little deeper and explore how the physical characteristics available to the sensory perception of taste, communicates its own name into auditory being! As we know, there are six flavor qualities which occur in varying degrees in any given substance. They are sweet, sour, salty, bitter, astringent, and pungent. Naturally, in chocolate making, I deal primarily with the first three in the list; carefully interweaving accents of the latter to create interest. Now, some things are obvious, such as people’s unabashed love of chocolate and caramel, but have you ever thought about the varying degrees of flavor contexts that could be used to amplify the chocolate caramel experience? I have… quite extensively I might add. I dare to say, that in the name of all things Divani, we have hardly missed a beat in this arena. Some of you may be familiar with our Gourmet Chocolate Caramels I presume? We have pushed the limits on what’s ‘normal’ when it comes to creating combinations based on these six flavors. Then, back to the naming thing, once a new chocolate caramel creation was made, I plopped that baby right in the center of my mouth, allowing it to coat every corner, then gently began to chew and “listen”. No – I wasn’t waiting to hear the chocolate’s plea for help as I mercilessly devoured every bit of it, but rather for its essence to whisper its name into being. One of my favorite examples of this phenomena is the “Midnight Sun”. Fancy this – Semi-Sweet dark Belgian chocolate plated above and below a surprisingly vivid orange caramel center. It’s as if the solar life force of our galaxy were shining its blissful rays at the peak of night! It’s brilliant! A few more examples of this profound naming process are as follows: Rumalicious, Berry Patch, and Gingerbread. And those are just the caramels! We also have Karmaluscious Barks such as Tropical Tease, Fluffernutter, and Allegheny Forest whose names divulge a depth of flavorificness! (So good they need a new word to define them.) And don’t even get me started on the creative beverages served in our cafe, and how these chocolate treats can easily be combined indefinitely with various drinks to create all new, yet to be named experiences! By now, I’m pretty sure you’re hip deep in Wonderland, so I’ll just leave you with that for now. Of course, if you’d like to get belly deep… pay us a visit! The post Down the Rabbit Hole of Flavor Profiling-Part 2 appeared first on Divani Chocolatier. ~ Quote from a dream I had once. When asked how I come up with the flavor combinations for our chocolate confections, an enigmatic response arises. Sure, it may seem like a straight forward process, but truly, it is based upon a menagerie of ideas, concepts, and inspirations. I’ll start with the ‘name creating flavor’ approach. It’s a rather quizzical and philosophical metaphor posed by Juliet, which makes for great romantic tragedy, but I have a feeling had Romeo been named Seymour Butts instead, he might not have shaped up to be the person he presented to Juliet on the night of their meeting. Nor would Juliet have been too eager to become Mrs. Seymour Butts. You see, sounds carry information. And information does just what it says it does, it puts things “in formation”. It arranges circumstances and knowledge with imagery, giving way to a specific, definitive outcome. Certain arrangements of sounds, when uttered together, could convey to a listener anything and everything from confidence to mystery to humor to innocence. When was the last time you heard someone describe a food and said something like, “Oh that sounds delicious!” or “Ew, that sounds disgusting!” based solely on the sound of the word(s)? It’s because the sounds carried forth information based on a plethora of perception. Now, some perceptions are more obvious than others, being that they are indeed from a relatively modern era and can be traced back to their origins. Still others come from a space seeming otherworldly and inexplicable. But we won’t go there for now. After all, in the art of naming confections for consumer appeal, one must remain harmonious with common contexts. So where does this bring us? Close your eyes…. no wait… don’t close your eyes, you are reading and won’t be able to continue if you do. Okay, so… leave your eyes open… but allow your mind to drift freely when you read these next words and utter them aloud. Now add the layer of knowledge that this is a collection of chocolates in a box. What might be in it if you were the creator? What combinations would convey these sounds into flavors? Or, even if you don’t want to get as involved as to dream up these tasty treats, just imagine if you were seeking a chocolate experience and happened upon an assortment by this name, without even looking at the contents, does your first instinct whisper, “You have got to try those!”? Well, this is in fact one such variety of boxed chocolates whose name conveyed its contents. How does creamed honey with pure essential oil based flavors sound to you? That’s what they are. Here’s where a clever someone might say, “But I don’t like honey”. To which my response would be, “That’s why I didn’t call them Honey Dreams.” To have called it Honey Dreams would have diluted the essence of the experience and made it finitely attached to a persons perception of honey. “But wait!” you say, “I thought you named it first than came up with the combinations!” And I did, but it just so happens that these matters are sort of like Wonderland and somehow wind up being all inside-outsee and topsy-turvy. The name spoke of a delightful sweet, dream like experience, which was precisely how I felt the moment I tried creamed honey for the first time. Whisked away to dream land where all is divine! I just knew that sensation had to be enraptured by chocolate. And so it was. Wonder awaits at the bottom of the rabbit hole. Want to see what we mean? Try Sweet Dreams in Milk or Semi-Sweet Chocolate! The post Down the Rabbit Hole of Chocolate Flavor Profiling – Part 1 appeared first on Divani Chocolatier. Valentine’s Day. It’s is all about the love. Seems fitting that, hey… so are we! Hence, why we produce the one confection that pretty much says all there is to say in terms of love. Chocolate – or more specifically for this particular holiday, chocolate covered strawberries! Red, ripe, chocolate covered strawberries are great for all kinds of crazy love, such as: friendly love, family love, respectful love, appreciative love, sympathetic love, self love, and of course, romantic love. We tend to think a lot in terms of what sort of love these luscious delicacies are for, but what about the love that goes in to these sumptuous sweets? There are a lot of caring steps involved in delivering you and your loved ones the best of the best in terms of chocolate covered strawberries. Some are undertaken by ourselves, and others by those with whom we choose to work. So, here’s a little timeline snapshot of your Valentine’s Day berries in how they get from the farm to your, or your loved one’s, heart! First, being outside of our strawberry growing season here in Western PA, the strawberries are grown in California’s temperate region, are picked on a Saturday, then freighted the same day to arrive at our local distributor on Monday. Depending upon which day the holiday falls, we either pick up our reserved flats immediately or allow them to remain in store until day before dipping. Once brought to our kitchen, they are thoroughly washed in special high-alkalinity water to remove any pesticides, dirt, or all other residues that don’t belong. They are then spread out on a flat surface in a clean, cool environment to air dry. The very next morning, before the sun rise, they are individually hand dipped in our signature Belgian chocolate, and topped with the appropriate toppings. Finally, they are boxed and ribboned for presentation to our lovely customers! I make it sound easy, don’t I? But the truth is, it takes a lot of love and a lot of life-force to conjure up these fabulous confections for that one very special day – for everyone’s very special someones. All in all, to see the faces of mostly grown men, light up, when they pick up their Princess or Queen box of chocolate covered strawberries for their sweetheart – well, that makes it so worth it! The post From Farm To Heart appeared first on Divani Chocolatier. 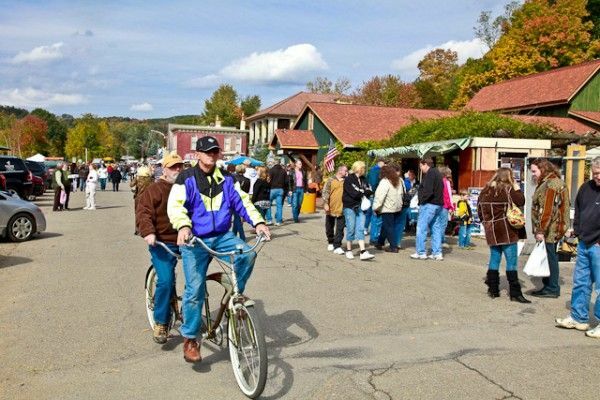 As vibrant tawny leaves transform the landscape in the Allegheny Clarion Valley, so too does the little town of Foxburg emulate the color-play on the mountain slopes, with the commencing of the Food, Art & Wine Festival. Throughout the day Sunday, October 12th, more than 40 vendors will pitch their colorful tents and display their whimsical wares and edibles for all to enjoy! Speckled about the street will be a variety of handcrafted and locally made items from which to choose, as festival goers prepare for the holiday season. 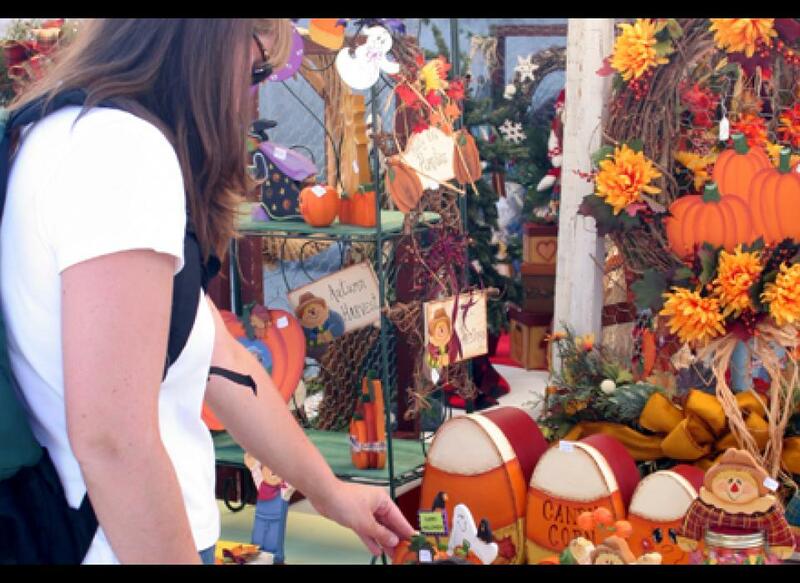 Jewelry, knit wear, soy candles, wooden toys, artwork, creative home decor, and much more are among the many fascinations you’ll find, as well as beloved locally produced favorites, such as Pennsylvania Maple syrup products and goods from the Farmers Market. Keep an eye out for newcomers featuring everything from up-cycled furniture to fishing flies, as some of the unique attractions to look forward to. And while you’re at it, be sure to swing by Foxburg Country Club’s booth and shop for golf related merchandise from one of the country’s oldest golf courses. Chainsaws will growl and wood chips will fly as professional chainsaw wood carvers create a multitude of sculptures live on site. Listen for the sound of melody amongst the buzz and be sure to dance to the sweet sounds of local musicians featuring everything from blues and contemporary rock to modern folk music stylings. Delight in the aromas of seasonal and festival foods that waft through the air, tempting your taste buds as they mingle with your senses. 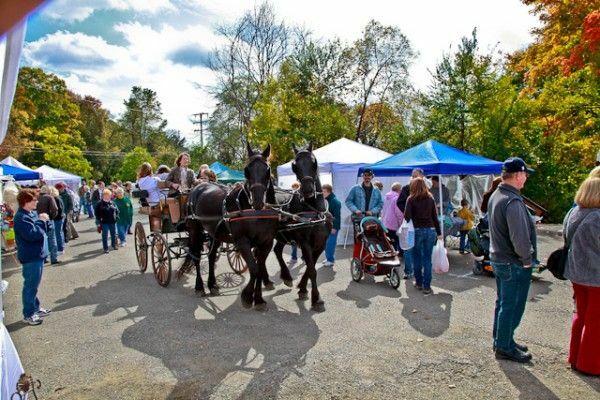 Kettle Corn, Apple Dumplings, and Philly Cheese-steaks are among some of the favorites to be present as well as delectable cakes from Uzi’s Pastries, traditional funnel cakes, gyros, fries and even pulled pork! You’ll not go home hungry! 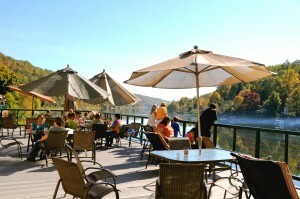 Town businesses will feature specials, including the ever famous Clambakes at The Allegheny Grille, on October 11th, the day before the festival, and German foods on festival day. Foxburg Pizza will feature their amazing specialty “Oktoberfest Pizza”, complete with bratwurst and red cabbage, throughout the month of October and will be a sure-fire delight to bring home Sunday night. Get hold of a taste of the season with a nice, hot cup of Pumpkin Spice or Maple Latte, Spicy Chai, or delectable Hot Cocoa from Divani Chocolatier and Barista to keep you toasty as you weave amongst the booths. Stop by later to make your selection of chocolate goodies to bring home keeping you feeling all warm and fuzzy for days. A limited supply of Gourmet Belgian Chocolate Coated Apples will be the delight of the month, so be sure to grab those right away! Foxburg Wine Cellars will offer tastings of their enormous variety of Pennsylvania grape wines and feature their Apple Wine in honor of the season. Also be sure to check out their new Wine Shine varieties, a brand new selection of smoked meats and cheeses, and their extensive gift offerings. Enjoy your selection beneath the fall foliage of the grape arbor along with live music, between your rounds from place to place. All in all the 12th holds the potential for a fantastic day full of fall festivities and delights. See you there! 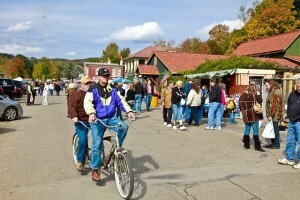 For information about parking and how to become a vendor, please visit www.FoxburgFestival.com.